To help you make the most of your ski vacation, Deer Valley limits the number of lift tickets sold each day. During the holiday periods such as December 26 through January 3 and February 16 through 20, the resort typically reaches capacity. We recommend our guests purchase tickets online prior to arrival to guarantee access. Tickets can also be purchased at several locations in and around the resort. The online advance purchase rate does not apply during the above holiday periods. Please don’t hesitate to call. Please check back for the 2018-2019 ski lift ticket sale date. Guaranteed Passes are tickets issued for specific days, per your order. A Flexible Pass is a card that may be redeemed for the specific number of days, per your order. If you wish to purchase eight or more days, please call the Ticket Office. Flexible tickets are not available if your days overlap a holiday period. *Please note that once tickets are issued they are non-refundable and may not be transferred. Flexible Passes are not available during the holiday periods of 12/26/2018 - 1/3/2019, and 2/16 - 20/2019. *Please Note: Afternoon lift tickets are available for purchase at 12:15 p.m. or later on the day of skiing. Afternoon tickets are not available on days we reach capacity. **Valid on Burns, Snowflake, Silver Lake Express, Viking, Judge and all conveyor lifts only. Can’t get enough of Deer Valley? Well, we can’t get enough of you either. For those who hit the slopes frequently, a Season Pass may be a smart choice. 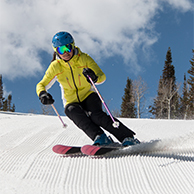 A Deer Valley Season Pass gives you unlimited access to the resort. Purchase an eligible season pass and receive a complimentary Ikon Base Pass with the option to upgrade to a full Ikon Pass unlocking access to 37 other iconic destinations. Early season pricing available through October 16, 2019. Winter daily lift tickets: 8:30 a.m. to 5 p.m.
Summer daily lift tickets: 9:30 a.m. to 5 p.m. Season Pass Desk: 8:30 a.m. to 4 p.m.
Daily lift tickets: 8:30 a.m. to 2 p.m.
Winter daily lift tickets: 8:30 a.m. to 4 p.m.
Daily lift tickets: 9 a.m. to 2 p.m.
Daily lift tickets: 8:30 a.m. to 5 p.m.
Daily lift tickets: 8:30 a.m. to 4:30 p.m.
Daily lift tickets: 8 a.m. to 7 p.m.
Daily lift tickets: 8 a.m. to 5:30 p.m.
Daily lift tickets: 8 a.m. to 3 p.m.
Daily lift tickets: 10 a.m. to 9 p.m.
Daily lift tickets: 8 a.m. to 5 p.m.
Daily lift tickets: 8:15 a.m. to 5 p.m.
*Hours may be extended during peak periods. **NOT an Ikon Pass lift ticket redemption location. Group rates on lift tickets are available for groups of 20 or more when reserved at least seven days in advance through Deer Valley Resort's Group Sales Office at 800-424-DEER (3337), extension 6507, or 435-645-6507. Group rates are not available during the holiday periods of 12/26/2018 – 1/3/2019 or 2/16 – 2/20/2019. Pre-arranged group tickets can be picked up from any window at either the Snow Park or Silver Lake Ticket Office. For more information, please email smreception@deervalley.com. Want to learn more about our special services for weddings, corporate conferences or other groups? Check out our Meetings and Events section. Still have questions about lift tickets? See our Lift Ticket FAQ or call our Ticket Office directly at 435-645-6625.